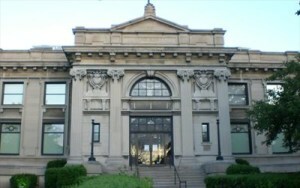 The November 15 meeting will take place at the Port Huron Museum of Arts–Carnegie Center. Constructed in 1902, this former Carnegie Library building was saved from demolition by a dedicated group of volunteers and opened on May 3, 1968 as the Museum of Arts & History. Port Huron, positioned where the St. Clair River flows out of Lake Huron, and just a hockey puck’s throw from Canada, has always been an important maritime and railroad center. T. J. Gaffney, well-known to many of us as a railroad historian, will share his extensive knowledge of how rail and maritime commerce shaped the area. We will also hear from Paul Maxwell who is the director of the Port Huron Township Downtown Development Authority. Paul is very involved in the preliminary planning for a new Amtrak station in Port Huron. Amtrak’s Blue Water route sees many passengers from Canada and we hope to have a number of our Canadian friends with us for the meeting. Following the usual no-host lunch at Lynch’s Irish Tavern, Mr. Maxwell has arranged for us to take a Trolley Car Tour of past, present, and future rail sites in the area. The trolley is heated, but you will want to dress for the weather, as we may be outside for parts of the tour. You might want to think of making a weekend of it, especially if you reside in the western part of the state and seldom travel to the Blue Water shores. See the links below to help with planning. The Great Lakes Maritime Center (Vantage Point) offers an excellent place to view passing freighters and tale advantage of a variety of opportunities to learn about Great Lakes history and current events on the Lakes. Winter hours daily 8am – 6 pm. Thomas Edison Depot Museum is closed for the season, but you can walk around the grounds and peek in the windows.